Your computer keeps extensive information about everything you have done - which web sites you have visited, what e-mails, documents, pictures or video files you have viewed, and all of your other computer activities. Even if you delete your files or use the "private" mode of you browser, many of the tracks are still retained and can be easily recovered. In time, these tracks build up and not only take valuable space on your disk drives but also raise severe privacy concerns. Cleaning up the history of your activities completely and safely is impossible without a specialized program because most of the tracks are not visible by any standard means, and cannot be removed manually. On top of it, this process must be performed every time you use your computer. Mil Shield 9.0 is the answer to all privacy questions. It deletes all tracks from your computer activities (including the infamous WebCacheV01.dat and INDEX.DAT files) and allows you to browse the Internet, work or entertain without fear and concerns. 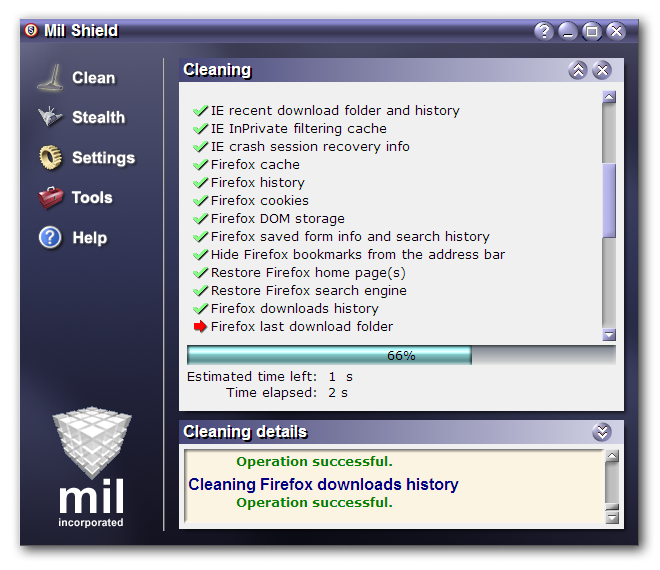 Mil Shield also cleans all unnecessary files and registry keys, which speeds up your PC and frees valuable disk space. Online support for two years. Mil Shield supports all the latest software: Windows 10 (both 32-bit and 64-bit), MS Edge, IE 11, Chrome 47, and Firefox 43. Copyright © 2003-2014 Mil Incorporated. All rights reserved.